Use the latest in AI to automate invoice matching within AP before it gets to your ERP! The robots are coming to AP. But there is no need to worry. DataServ has tamed the manual invoice matching process with artificial intelligence (AI) and process automation technology. Skip over RPA and actually eliminate the UI interactions in your AP matching process! Thus freeing up your human team to make decisions beyond the comprehension of a robot. People don’t want to be robots – we want to use them to make the world a better place. You know the value of increasing purchase order (PO) spend – it gives you the best financial controls with the earliest visibility. DataServ has worked for many years with companies that have a high PO percentage but then spend time on the backend matching all of those PO’s to receipts and invoices before paying them. Make the most of your purchase order process by having the majority of your PO invoices automatically entered and scheduled for payment! No other company in the world has done more to automate this PO matching process. With years of experience, we developed AutoVouch using the latest in AI to systematically eliminate human interaction with these complex invoice transactions. It works with 2, 3 or even 4 way matching. It is tailored to your business process. It incorporates an exception process and adjustable tolerance levels for price and quantity variance. Want to share how AutoVouch works? At the heart of our AutoVouch solution is the Invoice Processing Machine™ (IPM) which uses the latest in SaaS OCR technology to get all the various paper documents into digital data which the system can use. 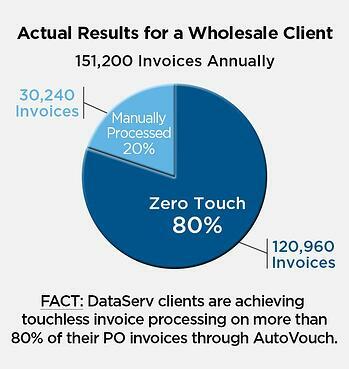 AutoVouch uses advanced process automation to perform a "pre-ERP" two or three-way match using the digitized invoice data plus your PO and receiving data, rules and tolerances. 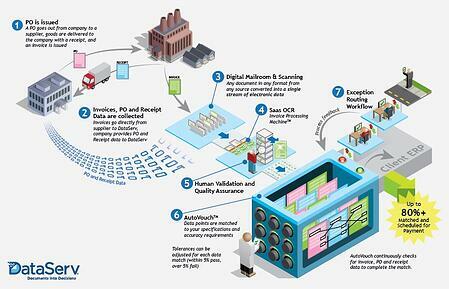 Each transaction is then evaluated against multiple criteria such as Vendor ID, Invoice Date, Total, Subtotal, etc. Price and/or quantity variances are identified and compared against acceptable levels which can be passed or routed for exception processing based upon your tolerances. Robust exception workflow not only automatically routes invoices that need further processing to the appropriate person but also provides process statistics for managers to create improvements. For service-based invoices where receiving data is not required, but a purchase order is in place, the system intelligently applies a two-way match process. All transactions that match automatically flow into your ERP system to be scheduled for payment. There is ZERO human touch! AutoVouch makes a great addition to your Purchase to Pay automation solution and helps your team focus on higher value work, while dramatically reducing errors and manual labor. The cost to process an invoice decreases substantially with AutoVouch. Eliminating manual matching saves you time and money and provides true "touchless" processing of PO invoices. This empowers your most valuable assets to use their most valuable asset – brainpower – to solve the most difficult problems, like making the overall process better.